Cliftonville manager Paddy McLaughlin will be totally focused on the Danske Bank Premiership clash against Glentoran on Saturday and not the saga involving Glens boss Gary Smyth. It seems Smyth might be leaving the east Belfast club after tomorrow’s encounter with a new manager coming in. But former Institute manager McLaughlin says they has nothing to do with him. “We will just concentrate on ourselves and we have had a wee break there and they are back in and they are fully focused on the Glentoran game. “Whatever is happening at the Oval will be a distraction for them and not for us. McLaughlin has been in charge now at Solitude for a number of weeks and he believes he is starting to gel with the players. “I am learning all the time and every session we are learning more about each other. “We are getting close to what we want out of the players in terms of the way we want to play and the fitness levels that we want. “They have responded well to what we are doing and there work ethic in training has been superb. “They have put the graft in and hopefully we can get a few results together. “The split is coming up so we have plenty of big games coming up. 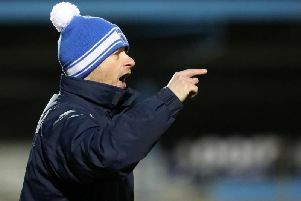 “All the games in this division are tough so we know the Glens will be a real test for us. And Glentoran’s Chris Gallagher says he is enjoying his time at the Oval and that he wants to win things with the east Belfast club. “And as a player, even at this young age, I want to be winning titles and silverware, no matter if it’s the league or the Irish Cup or the League Cup. “I want to win silverware at the end of the day and that’s what they are trying to instil in us, that winning mentality. “It’s going to take time, there’s no doubt about that, but I think next season we will definitely be a lot better. “But our target now until the end of the season is seventh place to get that European play-off spot and with the squad of players we have there, it’s more than achievable. “The last few years haven’t been great for Glentoran but the fans have still been brilliant and in my short time at the club, they’ve been exceptional with me and the team.